While this room is clearly part of an older house, you can do a number of things to get a similar feel in your own home. Choosing a wide plank wood floor provides a great starting point. This type of floor sets the tone for the space. It also works better in a long narrow room such as this one. This floor has a matte finish so that it feels like it’s been walked on for decades. A hand-scraped floor – available in a number of finishes – also feels like something from another time. The wide hand-hewn fireplace would be difficult to reproduce. Think about a natural stone hearth and surround to re-create the feel of a fireplace from yesterday. The extra-large hearth provides room for rustic accessories. Farmhouse tables such as the one shown are available in both new and antique furniture stores. Accessories such as hand-turned bowls and handmade pottery keep the craft-oriented focus. 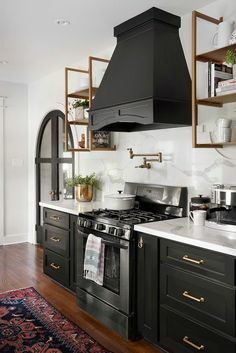 The braided rug to the left and the open shelving on the back wall also spell out a time when people did things for themselves. If you are not handy with wood or fabric, you can still have that hand-crafted feel to your home. Take the time to explore antique shops and craft fairs to find handmade accessories and furniture. Use dried grasses and flowers to add features such as the wreath over the fireplace. And consider a warm wide-plank wood floor to help set the tone. Warm and inviting, this room immediately creates a romantic mood. The flowers, the antique linens and painted furniture combine with the art and accessories to take you to another part of the world and even another time. Whether for your bedroom or a guest room, the simple handmade feel of this room makes for a unique and even exotic space. 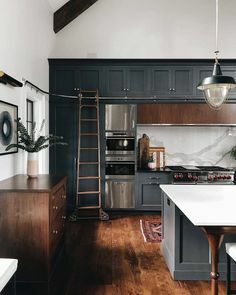 What can you do to create this type of mood in your own home? Start with the floor. The terra cotta color of the textured tile is reminiscent of old unglazed flooring common in Latin America. It sets the stage for a simple yet dramatic space. This room has a small area rug by the bed, but a larger rug or two in soft tones would work well, adding warmth and a sense of softness. The bed is beautiful, clearly hand carved and painted. While it would be difficult and expensive to find or reproduce, any four-poster adds this sense of old world style. Finding a used bed frame and painting it would bring you close to the same look. The linens are also unique, but comparable options are available in some linen stores. Antique and thrift shops can also carry this sort of thing. Don’t limit your search to bed linens. Both the canopy and bed cover could be created with handcrafted tablecloths. This room’s architecture has plenty of personality. If your room is more standard, consider paint and art to add character. This may be the space to show off accessories acquired on your travels. With a little effort and thought, you can turn a typical bedroom into something more exotic and unique. If you’ve been through at least one Midwest winter, you know it gets pretty cold. Even though your home is probably heated well, the floors can stay frigid, especially in the bathrooms. Stepping onto a near-freezing tiled shower floor is miserable. It will send chills up your spine just thinking about it. Well shiver no more! There is now a revolutionary pre-built floor heating mat designed specifically for showers. It is actually the only one of its kind in the industry. Nuheat can be used with other flooring types such as laminate, but for today, we’ll stay focused on cold shower floors! The Nuheat Shower Mat is installed directly onto the subfloor of a sloped shower base then tile is installed on top. The temperature is controlled by using a variety of programmable and non-programmable thermostat options. It couldn’t be simpler to start enjoying your showers even on the coldest winter morning. The Shower Mat is 32″x32″ with a 5″ center drain cutout, is suitable for slab construction and many pre-built shower bases. With 21’ of leads, heat is distributed evenly with no cold spots. Its 25-year warranty makes the Nuheat Shower Mat a long term addition to your home. Century Tile is proud to be carrying this innovation and contributing to the enjoyment of your home. With this being such a hot new product, the quantities may dwindle quickly, so be sure to get your Nuheat Shower Mat today, The Century Tile team will be happy to assist you in learning more about the mat and how it will work in your home. Give us a call today at 1-888-TILE-YOU or stop by your local Century Tile store. We look forward to helping you stay warm and toasty! Nuheat Floor Heating Systems is the leading manufacturer of radiant floor heating systems and has been featured on TV and in many national publications. Their quality products are affordable yet give the luxury of warm floors to homeowners across the country. What better excuse to eat chocolate then Valentine’s Day? We hope that you received plenty of chocolate this year! Just in case some ended up on the carpet, here are a few tips on how to remove it! Fireplaces add a lovely touch to any room, and they can work well with your beautiful floors if you take a few precautions when you install them. This fireplace does everything right. To begin, it was installed with a tile surround and hearth to catch any stray sparks or spilled ashes. Tile provides an easy to manage surface for a hearth and from a design standpoint it can make your fireplace stand out in the room. Select a tile that suits the style of your home. Stone is another beautiful choice for a hearth, and can fit well with more traditional homes. The next important design feature for safety is a fire screen. Your best option is an installed screen like this one. Screens vary from stand-alone three-part wrought iron options to curtains of metal or even – your safest choice – a metal-grid door custom built for your fireplace. Although a more expensive choice, it can be beautiful and secure. Fire safety is also floor safety. Keep your fires small enough to be contained within the firebox. Use only enough paper to start the fire – extra can drift away from the center on drafts of hot air. Be sure to clean extra ash out of the fireplace regularly, and always make sure your fire is completely out before leaving the room. With just a little thought and effort, you can enjoy your fireplace and make sure your beautiful floor stays beautiful. You can live big in a small space if you make smart design choices. This condo provides a great example of steps you can take to make your living area functional and interesting. Let’s take a look at why this works so well. Step 1: flooring. Small spaces seem bigger when you use only one type of flooring. This light porcelain tile works perfectly. Setting it on the diagonal moves your eyes through the space, increasing the perceived size. Rugs such as the one in front of the fireplace allow you to define specific functional areas in this great room without closing off any space. Step 2: furniture choice. By choosing one wood tone and style, all the furniture connects even though functionality varies. This room manages to have a kitchen, dinette, bar area at the island, dining room and living room while still feeling roomy. 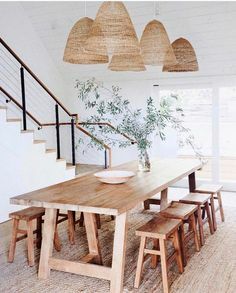 Other furniture choices such as using a love seat rather than a full sofa in the living area and selecting a circular table in the dining area keep the space clear with a natural traffic flow. If you constantly have to move to avoid furniture a space quickly feels too small. There is plenty of space to maneuver here. Step 3: light. By selecting a light tile for the floor and coupling it with white walls and sheers on the windows, the space feels open and inviting. The dark furniture anchors the room and keeps it interesting. With all the light tones, the room itself almost disappears and the focus is on each living area. Picture each area enclosed in walls and you will understand how much living has been tucked into this room. Are you letting a small space feel smaller by your flooring and design choices? Maybe it’s time to open things up! With work, children and the general priorities of life, often romance gets pushed aside. As we head toward Valentine’s Day, let’s consider how to create a romantic afternoon or evening – to celebrate a relationship whether it’s a holiday, anniversary, or just an opportunity to remind your honey that you appreciate him or her. How about recreating the mood of a picnic without going outside? Start by wandering around your house. Do you have a fireplace? That’s the natural location for a romantic setting. How about a window with a great view? A cozy den or corner of the family room would also work well. The next step is setting up the space. If you have tile or wood set at least one area rug on top of the space. If possible, consider piling two or three on top of each other to add cushioning and interest. Area rugs of different sizes, shapes and colors can make a space feel almost like a Moroccan tent – exotic and exciting. Add some floor cushions or a bunch of pillows to make floor-sitting more comfy. Now plan the food setting. Place a simple tablecloth or scarf on the rugs to designate the eating area. Add one or two vases of fresh flowers and some candles. You may want to choose the new LED faux votives like the ones in the photo to avoid the risk of fire on the padded surface. For food, choose finger foods such as shrimp, fresh fruit and cheese and crackers. You may want to serve in courses, bringing out one type of food at a time. Consider fondue or any other type of food that leaves you time to talk and relax. To give your sweetheart a part in the plan, ask him or her to bring the wine. Step back once everything is set up and take a look at the final presentation. Does it look inviting and intimate? Turn off all the lights except for the candles and take one of your flowers apart and scatter the petals on the tablecloth and rug. You’re ready for a lovely time.